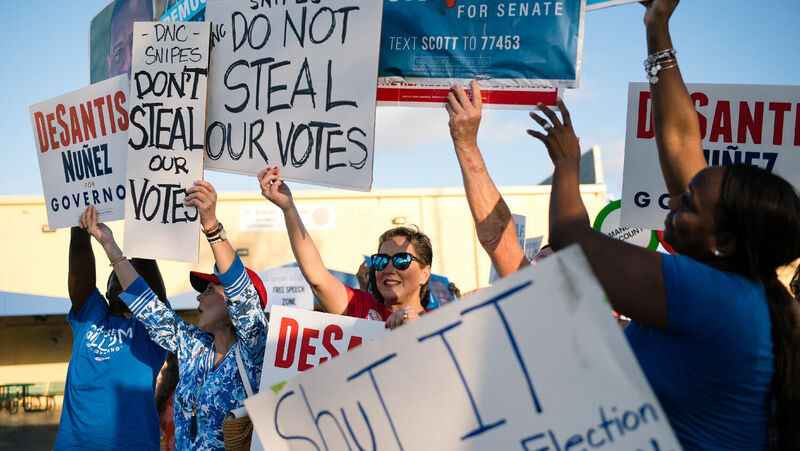 Protesters in support of Desantis and Gillum gather outside the Supervisor of Elections office in Broward County, Florida, where a recount is taking place for the gubernatorial and senate elections. Eighteen years after Bush v. Gore, the American election system is once again under attack. Something deeply disturbing is happening in Florida, and you need to know what that is. On November 6, voters across the United States went to the polls to elect their representatives to Congress. The final results from these elections will define battle lines across the nation for the two years leading up to the U.S. presidential elections. The Democrats won a majority in the U.S. House of Representatives, but Republicans held the Senate and even gained a seat or two. But why have Democratic fears come true? You need to know. Not many Americans understand where the battle lines have really been drawn. But President Donald Trump, Senate Majority Leader Mitch McConnell and others understand that to build a political firewall against radical leftists, they must reform the U.S. judiciary. United States laws are passed in Congress and signed into law by the president, but it is the judges who interpret whether the laws follow the Constitution. As Trumpet editor in chief Gerald Flurry has vigorously highlighted, Democrats know they cannot get control of America through the voting booth and through the passing of legislation that advances their anti-constitutional agenda. So they work to stack the judiciary with judges sympathetic to their cause. Other important elements of the president’s agenda continue to run into the Ninth Circuit. And with a plurality of radical judges on its 29-member bench, President Trump is going to continue to have to eat a mouthful of judicial gruel. But things are rapidly changing, and this is where we need to be paying attention. The Florida recount is deeply disturbing. Under President Trump, the Republicans have fixated on retooling the judicial bench by appointing young conservative judges who believe in traditional U.S. constitutionalism. And the Democrats can see not only that this encroaches on their ability to push through backdoor legislation but also that it loosens their grip on the total balance of power. And there is much weeping and gnashing of Democratic teeth. Yet if the Democrats were once asleep at the wheel, they aren’t now. The Florida recount shows the lengths to which the Democrats will go to take a Senate seat. The seat is important. If President Trump’s nomination train continues, the Democrats may lose control of key U.S. circuit benches, and perhaps another seat on the Supreme Court. Can we see why the Democrats are trying to illegally reverse—otherwise known as steal—the Senate election result in Florida? They are desperately trying to reverse the initial result that Republican Rick Scott defeated Democrat Bill Nelson. Republican Sen. Marco Rubio highlights the deceit at play. He posted four tweets on November 13 explaining the situation. For example, #Florida law requires that the voter signatures on mail ballots match the signature of the voter. It reminds one of the statements Joseph Stalin is said to have made, “It’s not the people who vote that count, it’s the people who count the votes.” Are we seeing collusion between politicians, the media and lawyers and judges like we did in the 2000 U.S. presidential elections? Are we once more seeing electoral treachery at the highest levels of the American judicial system? Even left-wing Vox admits there are nine major problems with the way the vote was tallied in Florida, though it attributes these problems to incompetence rather than fraud. In total, over 80,000 new votes have mysteriously turned up in Broward County and another 15,000 in Palm Beach County since the polls closed. These ballots have been breaking almost 3-to-1 in favor of Democrats. Investigative journalist Laura Loomer reports that a provisional ballot box from the Broward County Supervisor of Elections Office was discovered in the back of an Avis rental car at the Fort Lauderdale Airport five days after the election ended. The car was last driven by Noah Holliman, a Democrat who works for Broward County. It is unknown whether the ballots in this box were tampered with during the five days they were missing, but this is not the first time that Broward County was accused of election fraud. Broward County supervisor of elections Brenda Snipes admitted in court that her office allowed non-citizens and felons to vote in the 2016 election. So, it is no exaggeration to say that the American political and election system is under attack. Has anything changed? It’s getting worse, just as predicted. The fraud being committed is happening after the election. It’s all diabolical and motivated by the radical left’s rage and anger and desperation to maintain its control of the judiciary. Mr. Flurry has said that the Bible indicates that President Trump is gaining a formidable upper hand in the ideological and political war engulfing the United States. It’s a matter of national survival. Are we awake to this? The Bible shouts at us to wake up. Too many of our people are slumbering and sleeping. The Bible tells us to be vigilant—to watch and to be awake to what is happening to our people. Amos 6 explains that Joseph, the ancient patriarch of modern-day America and Britain, is afflicted, and hardly anyone cares! Hardly anyone is willing to lift a finger to tell America how sick it is. The division in America has reached critical mass and is ready to explode at any moment. Amos 7:7 says God is mathematically measuring the destruction of America. That’s not pleasant news in the short run. And for most people, that’s where they turn away. The brutal truth is hard to take. We prefer to be at ease, to put far away the evil day, and to lie upon our beds and couches and feast on the last gasp of national materialism. America is about to have its national house come crashing down on its head. We take no pleasure in saying this, but history itself tells us what is coming. The diabolical evil happening in Florida is an escalation of the division and anger that is a bitter tempest in the short term. Yet if you follow the Trumpet, you know it is leading to the most wonderful conclusion for America—true national freedom in the Kingdom of God. It’s coming sooner than you may think.